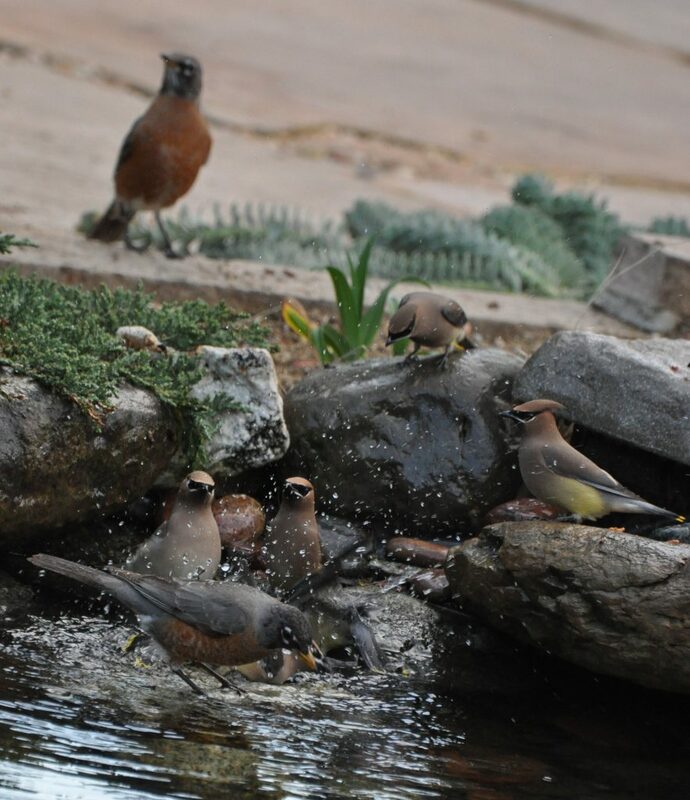 This is the time of year when American Robins gather into large flocks and Cedar Waxwings come South to stay warm. If you see a tight-knit flock of medium-small birds cruising around, quite likely they’re CEWAs. Follow them to their landing spot and get a special treat. The AMROs spend a lot of time in the trees yakking with one another; you may hear them before you see them. Both birds are a lot of fun to watch. From Wikipedia: The cedar waxwing (Bombycilla cedrorum) is a member of the family Bombycillidae or waxwing family of passerine birds. It is a medium-sized, mostly brown, gray, and yellow bird named for its wax-like wing tips. It is a native of North and Central America, breeding in open wooded areas in southern Canada and wintering in the southern half of the United States, Central America, and the far northwest of South America. Its diet includes cedar cones, fruit, and insects. The cedar waxwing is not endangered. The American robin is widely distributed throughout North America, wintering from southern Canada to central Mexico and along the Pacific Coast. It is the state bird of Connecticut, Michigan, and Wisconsin. According to some sources, the American Robin ranks behind only the Red-winged Blackbird (and just ahead of the introduced European Starling and the not-always-naturally occurring House Finch) as the most abundant extant land bird in North America. Your ticket for the: Keep Your Eyes Peeled — American Robins and Cedar Waxwings Are In Town!